The Task Assigner task enables manual, ad-hoc assignment of a user or group of users to a particular task within a process. It is often used in scenarios where the process is dynamic with respect to the individuals who are required to do specific tasks and requires some type of manual intervention by a person within the process such as a Project Manager. Please Note: The Multi-contact or Contact Search question types used in conjunction with the Form Assigner task type will also allow a user to lookup users to assign to a single task OR multiple tasks in a process. The only difference found in using this Task Assigner task type would be looking up pre-defined users or groups that would be recipients of a future single task. They are not presented with and completing a Form in the process. Please consider this when choosing the Task Assigner or the Form Assigner when needing Ad-Hoc task assignments. In the example above, a person will be assigned the task called 'Assign Approvers' and he/she will be able to search for and select anyone in the system. The individual that is selected (in this case Bruce Smith below) will be assigned to the approval task called Approval and will receive a notification just as if they had been assigned to the task as a standard recipient when the task was configured. It is best to determine where in the process you will be using the Task Assigner and who will be performing action of assigning a recipient to another task within the process before you begin the actual process development. Because of this, you will often find yourself adding the Task Assigner task to the flow before the task you are assigning recipients to, adding some additional tasks, and the coming back and actually configuring the Task Assigner task. 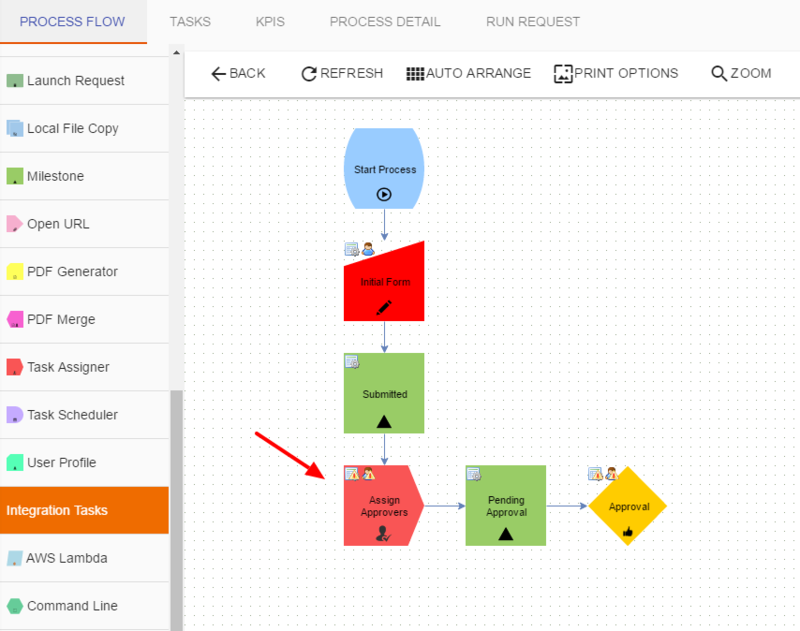 This configuration panel will enable you to define what task you will be assigning users to. Apply Assignments to this task Select List Yes List of all tasks in the process. Select the task which you would like to assign user(s) too. Queue recipients if all in order Slide Button No This option is unchecked by default. If checked, and you have marked the Process Rule for the Recipients on the target task as For All of the Recipients in Order then the order in which users are selected in the Task Assigner task at run time will be the order in which they are assigned to the task to complete. Do not allow user to complete task if no recipients were selected. Slide Button No This option is unchecked by default. If checked, the user completing the task assignment cannot complete the task until a recipient is defined. If unchecked, the user can complete the task without selecting a recipient to assign the task to. After any configurations are made, be sure to select Save when complete.